Washington State's native crayfish are found in freshwater lakes and rivers. Crayfish -- also called crawfish -- are common elements of cuisine in Louisiana and Sweden, but in the Pacific Northwest you're much less likely to find them making appearances on menus. These crustaceans can, however, make for an interesting and delicious meal. If you're among the crayfish connoisseurs of the world, you can fish for native and introduced species in freshwater lakes and rivers throughout Washington. Washington State's native crayfish is the signal crayfish, and it thrives in freshwater lakes, streams and rivers throughout the state. 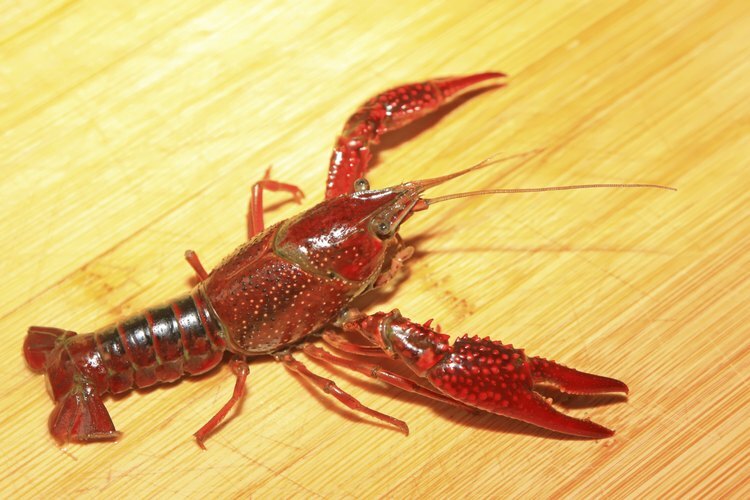 This species is larger than the two types of crayfish found in Louisiana: the red swamp and white river crayfish. You will, however, occasionally find red swamp crayfish in certain areas where they have been innocently introduced and have become an invasive species. In this case, you're actually doing the ecosystem a favor by catching them, as they can damage habitat and overtake native species. Some of the best places to go crayfishing in Washington include Lake Washington, Pine Lake and Lake Sammamish, all in the western part of the state. These are large lakes that offer the ideal habitat for the crayfish: shallow water with cover of grass or reeds for young crayfish to find protection, plus deeper water for adult crayfish to thrive. You can find fully grown crayfish to harvest in water around 15 to 30 feet deep. These lakes are also accessible to the public, as they have areas where you can launch a boat to go fishing. To fish for crayfish, you must first obtain a tar trap, minnow trap, ring net or pot -- common devices for trapping these crustaceans. These traps can be found online or at sporting goods stores. Mark your device with a buoy so you don't lose it, and submerge it in water that is 15 to 30 feet deep. You can bait the traps with salmon chunks, chicken necks or gizzards, cat food or dog food, or fish carcasses from another fishing trip or from a fish-cleaning plant. You'll have the most luck if you set traps at night in areas where the crayfish like to hide: rock piles, boulders and weedy areas. There are few restrictions on the sport fishing of crayfish in Washington. Sport fishers can set two traps per person and do not need a license to do so. You are required to mark your pot or trap with a flotation device, and there is a daily limit of 10 pounds per person. In Lake Washington, the crayfish season opens the first Monday of May and runs through the end of October. There is no limit on the amount of nonnative crayfish you can harvest. If, however, you're unable to spot the difference between native and nonnative, the state asks that you apply the rules governing the harvesting of native crayfish.